It seemed easy enough: clear all cats from a 14,000-acre island once used as U.S. Navy weapons-testing facility. In the end, however, it took six agencies, 18 months, and cost $3 million to get all the felines off California’s San Nicolas Island. The island, located 60 miles of the coast of Los Angeles, is home to rare animals and other species. Cats were brought to San Nicholas in the 1950s by military personnel, but over the years they have become a threat to rare indigenous life, such as the island night lizard, have eaten nesting seabirds, and competed with the native fox for food and other resources. The U.S. 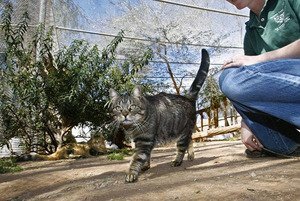 Fish and Wildlife Service initially proposed a catch-and-destroy plan, until the U.S. Humane Society offered to pay to care of the cats at a facility in Ramona, located near San Diego. But rescuing the cats was no easy task, as hunting dogs were frequently sidetracked by foxes, and digitally recorded meows were ineffective in luring the animals to traps. Biologists finally found a solution by using bobcat sensors on 250 custom-built traps. Once the trap was spring, a computer alert was sent, notifying a cat was ready for pickup. According to the Ventura County Star, this operation was the fifth largest animal-removal operation of its kind in the world that did not use poison. 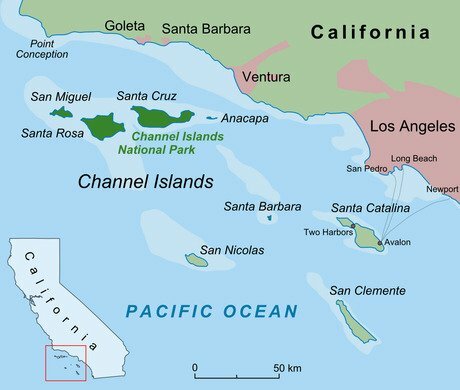 A map of the California coast and San Nicolas Island.